You might have a reader to read blogs. You might scroll your facebook feed for new posts. You might watch twitter or get emails or hop from blog to blog. There are a lot of ways to be updated about new blog posts on any topic you could imagine. When it comes to the topics of family, motherhood, parenting, marriage (all my favorite things to blog about)... well, you will find post after post after post with tips, tricks, helps, lists, how to's and more. Honestly, it can be very easy to get overwhelmed. So many opinions, thoughts and pieces of advice... all good... but so hard to achieve. I can't do everything I read. I can't always apply the tips and tricks. Throw in a few "how to" pins and you just might be in information overload. Sometimes what is meant to encourage can actually discourage just because of the enormity of information coming at women every day. So, I'll say what every woman is feeling. You can't have the perfect family and an amazing house and the most organized bathroom and the prettiest front door on your street with the most creative, delicious dinner cooking in your beautifully decorated kitchen. You can't be everything that every single post is encouraging you to be. Because God created you to be YOU! He made you to think a certain way and act a certain way and be a certain way. Now, in saying that... we ALL can grow and change and improve as we use our own unique skills, abilities and talents as God has enabled us to do. But real life is messy and sometimes unorganized. Our lives are "lived in" rather than a picture of perfection all the time. Real life can't be like every post you read. Your family can't live up to it all. And you will overwhelm yourself trying. You will frustrate your family always striving for what you see and read online. Should you stop reading and pinning and blogging altogether? I believe that God is using blogs and facebook and other social media platforms to connect, encourage and resource women everywhere. I'm blessed every day by posts I read and as a writer, I pray that the words I write are God moments for the women God has hand picked to read my posts. Friends, closing down your laptop and getting offline isn't the answer. Allowing the things you read to discourage you and make you feel less than what you are is not okay. How do you sort through it? 1. Be choosy what you read. Really. Find godly posts and blogs and friends to follow online who you know will pour good things into your life so that you can grow in the ways God is wanting you to grow! 2. Be aware of your personal expectations after being online. Don't step away from your laptop expecting too much from everyone around you... not to mention yourself. 3. Remember real life isn't like staged pictures for a blog post. When you look up from your online time, your house is still your house. Your family is still your family. Be thankful and enjoy the real life God has blessed you with! 4. Choose one really great thing from your daily or weekly online reading to work on in your family. Any more than that is unrealistic and just too much. Give yourself the time to make life long positive changes instead of hopping from one thing to another as you read the next biggest blog post floating around the web. 5. Let God speak to you about what in your life HE wants you to work on. Then, do some searching and reading about the topics that line up with where God has YOU right now. 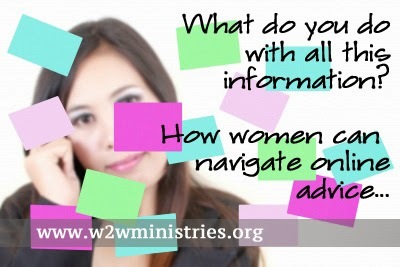 What are some ways that you sort through the enormous amount of information available to women online today? LOVE, LOVE, LOVE this Jenilee!! Excellent advice! !